Some could consider Faith Jenkins a Scrooge; after all, she wasn't overly fond of Christmas. But when a person got to know her better, they understood that Faith had too many bad memories of Christmases past. The highlight had been the previous Christmas when her boyfriend broke up with her. Now she tried to endure the endless Christmas merriment of the shoppers in the store where she worked, in addition to the relentless cheerfulness of her neighbor, Jeremy Kitteridge. He was epitome of what Faith knew she had to guard her heart against. He was relentless in his attention to her, eternally optimistic, sexier than about any man she'd ever met, and he had dimples. And she knew it would be the dimples that would be her downfall. Little by little, Jeremy knew that his pursuit of Faith would end in success. He was certain that she was interested in him, but she obviously had issues that she needed to overcome. He had no issue with that, as long as she let him help her, and, in the end, she was his. Underneath the Mistletoe was a touching romance with endearing characters. I adored Jeremy. He was exactly what Faith wanted, he knew it, and yet he wasn't cocky or arrogant. Instead he knew that he was winning her with his slow seduction. I truly enjoyed watching the sparks fly as the two of them would interact - Faith was fighting so hard against his attentions. I was touched by Faith's fears, and cheered as the two of them finally came together. 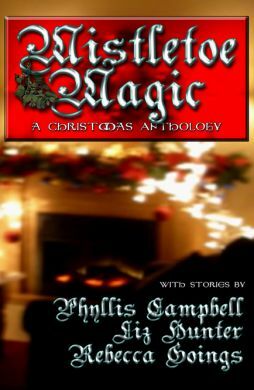 Underneath the Mistletoe is a short story in the Mistletoe Magic Anthology which includes 3 stories. The other stories are Blame it on the Mistletoe by Liz Hunter, and It Must Have Been the Mistletoe by Phyllis Campbell.